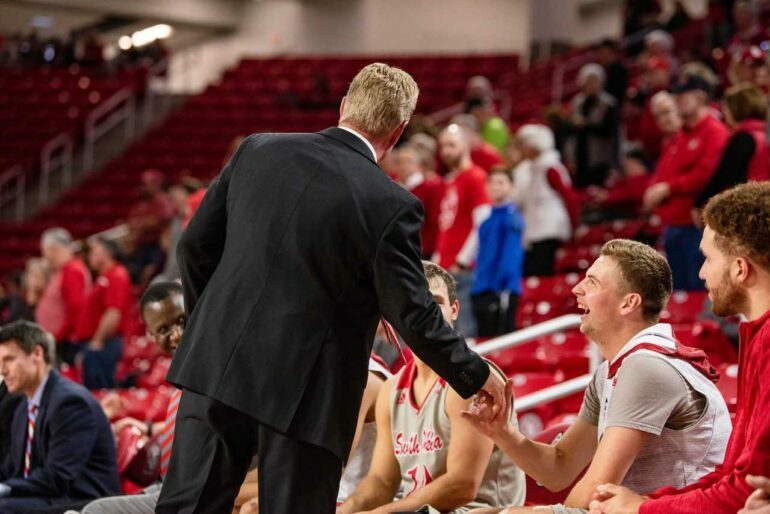 In search of depth for a roster thinned by injuries, the Coyote men’s basketball team found a new place to recruit: their own gym. Caleb Cline, a 6-foot-3-inch guard from LeMars, Iowa, joined the men’s team in January after a two-week stint as a practice player on the USD women’s basketball team. Head men’s basketball coach Todd Lee said Cline had reached out to the team in hopes of joining, and Lee, coaching a squad low on legs, welcomed the junior as a walk-on. Cline started his college basketball career at Northwestern College, an NAIA school in Orange City, Iowa. He transferred to USD his sophomore year and got a call from the coaches last semester. Cline said he came to USD with no intention to play college basketball, but two years later has found a role as a player on a Division-I program. Cline saw his first minutes on the floor during Thursday’s game against Oral Roberts, where he subbed in towards the end of the first half. Lee said he appreciates Cline’s verbal presence on the court. With hopes to one day coach college basketball, Cline initially joined the women’s practice squad to be around the game. He said helping players practice is much different than being the focus of practice. “It’s a different pace. As a practice player, you just helped along with the drills, but now as a player you have to go through the drills,” he said. Earlier this month, Lee said this season has been “the toughest year for injuries that I’ve been a part of in my 30 years of coaching basketball.” This, added to senior Jay Harvey’s departure and sophomore Jack Stensgard’s transfer to Wisconsin-River Falls, has forced Lee to do things most college basketball coaches don’t have to worry about.